A big part of supporting the Back-to-School transition has nothing to do with school — it happens in the many transitions at home around preparing for school. It happens in the morning as our kids get ready for the day at school and/or in the afternoon / eventing as our kids prepare for the next day at school. These many transitions and tasks at home are also where small changes and simple supports can be a powerful tool for our sensory kids. The morning transition can be one of the more challenging transitions as many of our rigid, anxious, or distracted kids have a hard time waking up in the morning, have anxiety about school in general, and/or know they will be working hard to pay attention and hold in together for the next 6 hours. Our goal is to make their mornings easier so they have more energy and willpower for the experiences where they will need it at school. Knowing that our kids are working through a challenging transition, let’s use our core Sensory Organizing tools and break it down, eliminate distractions, and create a visual guide. – A Simplified bathroom routine – only include what has to be done in the morning. – A Caddy (that can get wet!). This one is from Lakeshore Learning but they can be found at any home store. – Labels to number the tasks in order and to spell out task in simple terms. I found mine at Staples from Martha Stewart Home Office with Avery. – Clear packing tape to put over labels to protect from water. – For extra support, you could add a laminated Morning Routine Checklist and hang it on the wall or mirror in the bathroom. ***Put in the order that make sense for your child not what makes sense to you. If they like to wash their face before they brush their teeth, so be it. – It does the first step (and often hardest step for many sensory kids) of sequencing the task so they know where and how to start. – We’ve broken down the task into 3 manageable pieces. – We’ve batched the supplies needed in the order which will help our sensory kids stay on task. – We’ve created a visual checklist of sorts with the 1,2,3 Labels. – We’ve made it portable. 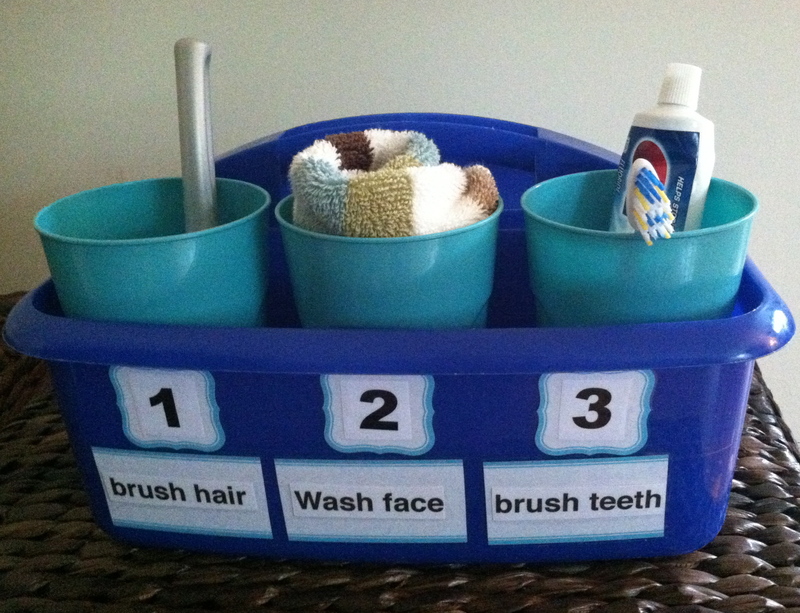 If our child if having a more challenging morning and we need to change locations or need to give them a choice in what sink they use to do their bathroom routine, this allows us to do that.